I recently purchased a used 2004 Santa Fe and love the keyless entry feature. I found out (the hard way) that there is a factory alarm installed, and was able to deduce the following: one click of the LOCK button on the key fob makes the horn chirp, the lights blink and all 5 doors lock; a second click of the LOCK button makes the alarm tone sound along with another blink of the lights, indicating that the system is armed and ready to wake the neighborhood if a strong gust of wind happens along. Hopefully this matches up with what the rest of you have probably known all along - but at any rate I was pretty happy with this setup and only rarely activated the alarm. Unfortunately, about 2 weeks into ownership I took the car in for its 120K mile service, and got the belts and water pump replaced. I didn't leave the fob at the shop, just the spare key. After picking it up the next day, I realized immediately that the LOCK button wasn't working very consistently or with great range, so I popped a new battery in the remote and drove off. However, that made no difference whatsoever and the LOCK function still works inconsistently and never with any honking or flashing of lights - just a faint "clunk" of doors locking if it happens to register the command at all. The UNLOCK button still works exactly as it always has and with the same range. Since I hardly ever use the alarm anyway I wasn't too concerned, but then a windy day or a neighbor's dog or something came along and set off the alarm which was evidently armed! Without ever being able to intentionally "arm" the alarm, I'm not entirely sure how to consistently disarm it (it's not always on, I don't think, or the alarm would go off way more often). The only dependable workaround I've found is to never use the LOCK button on the remote, instead using the one on the driver's door. At any rate, I took my car back in to the shop about a week later and asked them to reset it or check for a bumped switch or loose wire or something like that (the battery was disconnected during servicing) but my mechanic couldn't figure out what was going on - or get it to act consistently enough to diagnose the problem. So back to the workaround. Does anyone out there recognize this problem and/or have an idea of how to fix it? I'm 99% sure this is the result of being in the shop, so I'd really like to understand what it is I need to ask my mechanic(s) to watch out for in the future. And I've never had a car with an alarm system before, so I'm not even sure what kinds of questions to ask. Thanks in advance! Sounds like an aftermarket alarm. The factory alarn does not have a motion sensor. 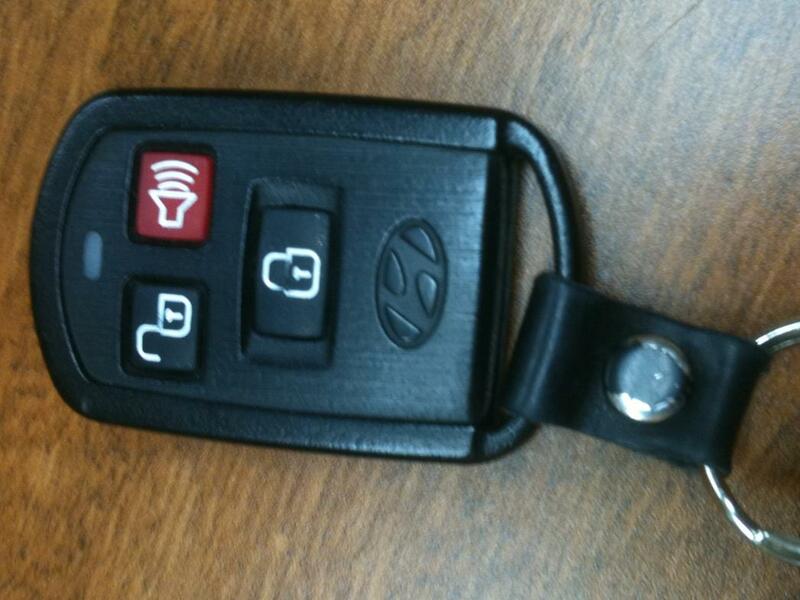 What does your keyless remote look like? The remote just has unlock and panic buttons at the top, and a large lock button at the bottom. I didn't mean to imply that it has a photo sensor of any sort; it's when the wind rocks it or the door gets bumped with some force that the alarm goes off. Thanks for responding! I didn't say photo sensor I said motion sensor. The factory alarm doesn't have a sensor the detects if the car is rocked or bumped. It only goes off if a door is opened. Okay, thanks for clarifying. So... if it's an after market alarm rather than factory as I assumed, does that change anything? Does anybody have any idea of how to get the (Hyundai) remote back to working the way it was before?! That's what I'm asking, is it a factor or aftermarket alarm? Can you post a picture of they fob you use to lock the car and arm the alarm? It's possible it is a factory alarm and the problem is a loose wire or door switch that is grounding when the car is rocked. Got it - attempting image attachment now! That appears to be the factory fob so my guess is one of the switches on the door or hood is bad/misaligned. how do you start/disable alarm on elantra with no fob, only the key?